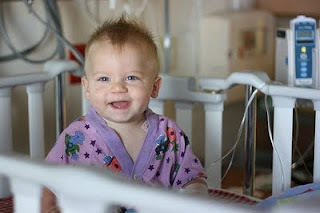 If you haven't been over to MckMama's blog about Stellan, but you've wondered how Stellan is doing, I have some good news. While he isn't entirely out of the woods, as you can clearly see, he is responding to treatment and has improved a great deal. God hears our prayers. Why this child and not others, I can't answer. But I do feel very strongly that God has a plan for Stellan and He is working through MckMama and Stellan to reach us. If you feel moved to help this family beyond prayers, they have a few special requests. I think we could all learn from this generous family. We want to help you. How can we? Our family would be tickled pink if you would take your willingness to give and to serve and to donate blood and to lavish love and whatnot and go and spread that out to other needy babies, children and families.